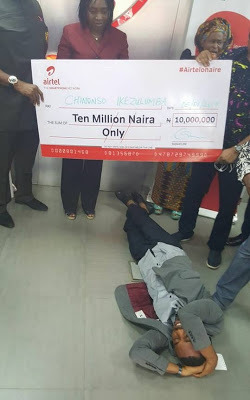 A young man residing in Awka, Chinonso Ikezulumba, won N10million in an ongoing Airtel promo and fainted during the cheque presentation. 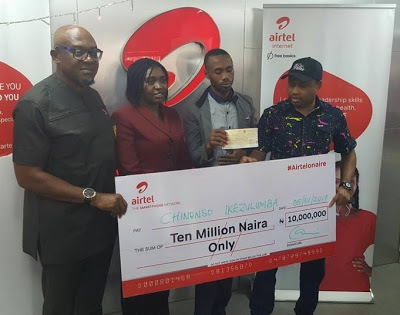 According to Joseph Akelicious who shared the story, yesterday when Chinonso was invited to the firm's Awka office to pick up his cheque, he thought everything was just 'story' until the Airtel guys brought out both the dummy and real cheque. Chinonso fainted but came to after some minutes. He said that he is a petty fashion goods trader at Nnewi but that his business has since collapsed. He had prayed to God over the Christmas to give him N10M to start his business again and just like that, the money came via Airtel promo. He was accompanied to the Airtel office by his mother and two sisters and said he plans to get married in May, and that he had already planned it before the Airtel windfall.